From the Mass Effect Pop! Vinyl collection by Funko. 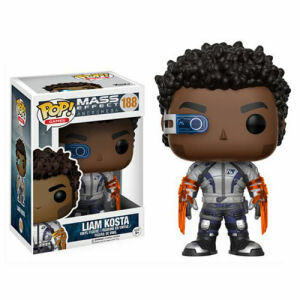 Mass Effect Andromeda Liam Kosta Pop! Vinyl Figure. From the Mass Effect Pop! Vinyl collection by Funko. Mass Effect Andromeda Liam Kosta Pop! Vinyl Figure. Each Pop! Vinyl figure measures 3.75 inches tall. These sylized figures have rotating heads and come in a displayable window box. Funko Mass Effect Pop! Vinyl shipping from Canada. No Surprise Border fees or Customs!